and modest fluctuations in home prices"
The world didn't end in 2012 and the same can be said for Vancouver's real estate market. 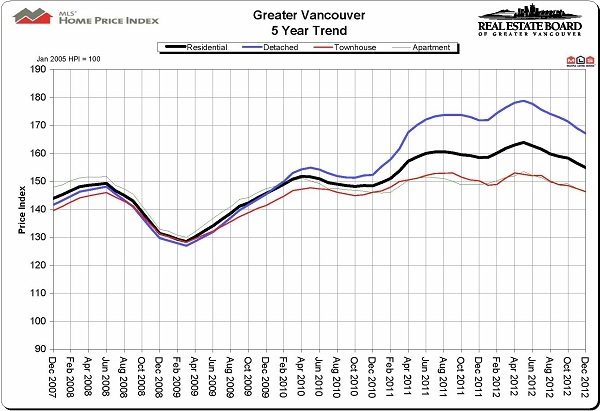 Overall we see a decrease in the price index starting early summer 2012. Which is normal given in previous years sales do in fact decline, and with it the price index, beginning between April / June. The only exception we see in are the years 2009 and 2011, where it was more level than a true decrease until winter. Drivers such as continuing low mortage rates and market speculation. Year to Year comparison in sales we see a total of 25,032 in 2012. The home sale total was 25.7% less below the ten-year average in the region. However, 2012's total listing was 6.1% above the ten year average in the region. Compared to 2011, there was a 2% decline (2012: 58,379 - 2011: 59,539) in number of residential properties available and 0.6% increase in regards to 2010 (58,009). Is it a good time to buy? Is it a good time to sell? 1) Actively searching for properties that can generate postive cashflow asking for a price they perceive to be good deals. They are out there, many as a matter of fact. Whether they be restricted to pure investments or a home that may be rented out in the future or rented out now, with the possibility of acting as a primary residence years down the road there are all sorts of investors looking at the market right now. 2) Waiting for the "bottom" of the market. The strategy here is to get a "maximum" on the return for their investment right at the lowest point in the curve, right before prices start to go up again. This isn't anything "wrong" or "bad" about it; the only negatives are potentially losing out on the property that nicely compliments their portfolio or even losing out on the perfect home that is available now. If one buyer thinks the home is pefect for them, another one will as well. With the release of this year's (or more accurately last July's) property assessments many home owners are taking a look at their needs, their reasons for considering a move. Was the house a short term investment, a flip? Were there plans for a downsize or upsize? We cannot forsee where the market will be a year from now, or even 3 months from now. What we can do is take a close look at the specific area the seller is living in and analyze the specifics. Prices across the board are still at an all-time high and sales are still being completed. Everything from studio apartments to multi-million dollar houses are being offered and sold. The best method is to see if it is a good time to sell is to sit down with a realtor and go over in detail the specific needs and expectations the seller deems important. The region statistics may say one thing, but the micro-markets (especially in Vancouver) may say another. I offer no pressure, no obligation, free home evaluations so you can have an idea of what your home is worth and determine what is the best action for you as a seller and a buyer. Let's sit down and have a conversation, you won't regret it. I guarantee.